Take the lulav (palm branch) in your right hand, with the hadasim (myrtle) on the right facing you and the aravot (willows) on your left. 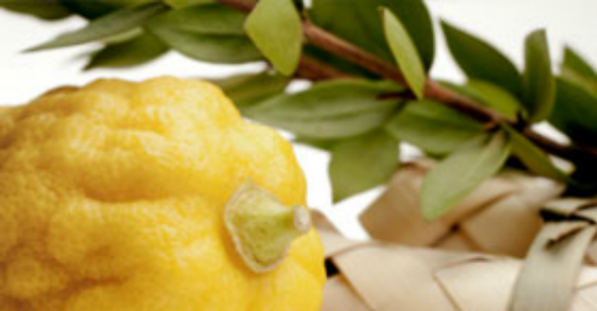 Then take the etrog (citron) in your left hand and place it in front of the lulav. Now hold this whole bundle together while standing facing the East. Before you begin, ask for God’s love and protection to fill your Sukkah. Now bring the bundle to your heart and focus on the heart center and its energy flowing through you and into the lulav. Stretch your arms out and point the lulav to your right and imagine the heart energy streaming out the end of the lulav in the direction that you are pointing. Now bring the lulav back to the heart and pause a minute to refocus your mind. Do this movement three times. The first time you go through this movement, focus on radiating the energy of God’s love and light into your sukkah. The second time, focus on sending the energy to the whole of the nation of Israel and the Jewish people. The third time, send the energy of God’s love and light out to the entire world. Rabbi Yoel Glick is a teacher of Jewish meditation and spiritual wisdom who has been teaching and guiding seekers on the path for over twenty years. Find him at Daat Elyon. Posted in ReSources, Sukkot & Shmini Atzeret. Bookmark the permalink.